When you see a log cabin kit for sale it’s critical that you understand the entire log home construction process and have a handle on all the costs involved. Log cabin kits for sale represent a substantial investment and it’s important that you do your homework, gather information and work with a reputable dealer. There are differences between buying a log home and a conventionally framed home. When you buy a log cabin package you are generally working with a log home manufacturer who will help design the cabin, provide a detailed materials list and deliver the log home kit or materials package to the building site. Once the basic structure and rough-ins are completed there is all the interior finish work, kitchen cabinets, windows and doors (if not included with the log home kit), trim and final plumbing and light fixtures installation. If you deal with a reputable log home manufacturer who has a log cabin kitfor sale they can help walk you through some of these phases and their costs and they will provide you with technical support for the assembly of their log package with videos, construction manuals, support personnel to answer questions, etc. To make a log cabin kit sale as smooth as possible, it’s vital to understand the construction process and to have an accurate and realistic budget prepared. You must not only be able to pay for the log cabin package itself, but for all the other construction phases that lead to a finished log home. It’s not enough to simply look at the cost of log home kits or log cabin packages. Even if you are doing the work yourself there are many more costs that must be factored in. You can save money on your log cabin kit for sale with careful design. Of particular concern is the recent boom in buying materials through a log home auction. 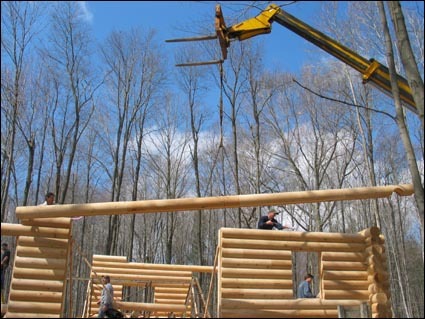 During an auction, home log kits are sold that seem like a real bargain, but without the advice of the log home manufacturer in regard to design, the construction process and a realistic evaluation of the costs involved in erecting and finishing the cabin, people can get themselves into trouble and tie up their money in a useless package of logs and timbers. Read the log home auction particulars carefully because you may be paying only a deposit on the log cabin kit for sale and obligating yourself to take delivery of the log cabin package at some time in the future. On the other hand, government land sales, or buying seized and surplus land by auction can result in tremendous savings and set you up with large land tracts to build your dream cabin. You can learn more about financing land and make a complex transaction easier to understand. Buying land before you buy your log cabin package or even before you get too far on the design is a smart idea. You will want to customize your cabin to your land and site costs may affect your building costs and design. Before you take delivery of your log cabin package you will want to have your utilities installed and be prepared for the delivery of your log home kit. Understand your overall budget to complete your log cabin. Talk to log home manufacturers, contractors, builders, developers, other log home owners.What you need is realistic cost information and solid facts, not wishful thinking and hopeful projections. Have your entire financing set up before you begin. You can get pre-qualified for loans easily, but this is not the same as a firm loan offer, like a pre-approval.Check with on-line log home lenders who have experience dealing with the unique issues involved in log home construction.Even if you’re considering cash or other ways of financing, be certain that all costs are factored in and consider a back-up plan with construction financing. Do your due diligence on the log home manufacturer that you will be dealing with. You can check references and recommendations with other log home owners in the greater Log Home Community. Check and see if the company holds a membership with the Log Homes Council. Consider the terms and timing of the log home manufacturers agreement; understand delivery specifics, refund policies and warranty details. Buy log home kits with confidence and be able to act quickly when you see your log cabin kit for sale once you understand the construction experience, new terms and costs involved in assembling and completing your log cabin kit.